As a premier, HIPAA-compliant telemedicine solution provider company, Chiron Health is dedicated to making routine visits easier and more convenient — both for the doctors and the patients. Our cloud software platform for video visits is secure, easy-to-use and designed to improve practice efficiency and patient care. Simple telemedicine software that allows physicians to connect with patients for routine appointments over secure video visit – and receive full reimbursement through private payers. 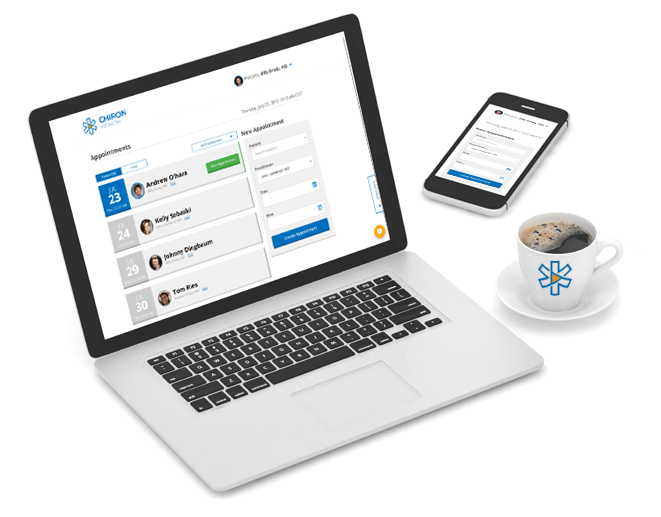 The Chiron Health cloud software contains full support for patients and physicians, EHR integrations, plus billing and reimbursement tools. Chiron Health is secure, HIPAA-compliant, and includes a business associate agreement. Automated patient insurance eligibility checks with the Chiron Rules Engine. No duplicate work is required. Schedule in your practice management system and the data is synced to Chiron Health. Private payer telemedicine reimbursement is guaranteed with the Chiron Reimbursement Guarantee. Are you a large medical group? Chiron Health understands the challenges of implementing new technology across your organization. We make the process easier with a hands-on on-site implementation, seamless EHR integration and a customized telemedicine marketing plan. We are so confident in the accuracy of the Chiron Rules Engine, we guarantee full private payer reimbursement of telemedicine visits, or we’ll pay the claim ourselves. The most advanced database of telemedicine insurance rules in healthcare. Our regulatory team has spent years converting complicated telemedicine legislation into actionable intelligence. We’re so confident in the accuracy of the Chiron Rules Engine, we guarantee full private payer reimbursement for telemedicine visits, or we’ll pay the claim ourselves.